Just a quick post on what's new and forthcoming from Mcfarland. In the interim of the withdrawal of Paul Morphy from chess to the ascension of Harry Nelson Pillsbury, American chess, and in particular the New York chess, which is the subject of the book under review, was dominated by two adopted Americans the Scotsman Captain George Henry Mackenzie and Irishman James Mason. Mackenzie, who came to this country in 1863, and served with the Union forces, made his home in New York after the Civil War. Mason, we assume will shall meet later in the series. Mackenzie, Mason & Co. promises to be the most thorough investigation of New York chess of the period in question. Part one covers the years (1866 thru 1867) just after the American civil war which was a great disruption to chess life in the country. The year 1866, begins with tournament of the New York Chess Club, a knock-out contest, arranged in the classes, each contestant played a small match until eliminated from the tournament, then winner of each class would play against each other, the higher class player giving odds to his opponent. Opponents were draw by lots and as luck would have it, the club's two most prominent members were paired in the first round, Captain Mackenzie and Charles H. Stanley. Mackenzie would win the match and in time the tournament losing but one game to Stanley in their match. Stanley before the appearance of Morphy, was considered by many to be the preeminent American chess player. The meeting of Mackenzie and Stanley was seen in the New York press as a meeting of the two best active players in the country, but exception was taken in some quarters in particular in Philadelphia where its champion Gustavus C, Reichhelm begged to differ. Reichhelm also had a champion in the chess editor of The New York Ledger, James C. Warner, who felt the naming Mackenzie and Stanley as the best players in country, was premature, and unjust to Reichhelm..A match was arranged between Mackenzie and Reichhelm, the match was looked by many as a match for the "championship" of the United States. Reichhelm was no match for Mackenzie, outside of the first game that ended in a draw (which did not count) Mackenzie easily won the match 5-0. As regards Morphy, the hard feeling his withdrawal from chess caused may be gauged by the following quote from Warner in his column in The New York Ledger. "...as Mr. Morphy no longer considers himself a Chess-player, there is no reason why others should do so. He has withdrawn himself from the chess world as something too good for contact with it. Chess-players in self-respect are returning the compliment by leaving the pseudo-champion severely alone." There were a number matches played by teams of New York players against other cities, either by correspondence or telegraph that are chronicled in the book, as well a number visiting players, who took advantage of being in New York and contested games against the local players. Charles A. Maurian, of New Orleans, " the well known acquaintance" of Morphy, played a number of off-hand games with Mackenzie while in New York. There are 142 games in the book, each game is given with contemporaneous annotations from the chess press of the times. Veteran players, from the pre-Morphy era were still active besides Stanley,such as Napoleon Marache, Theodore Lichtenhein and Augustus Zerega, as well players of a younger generation, Philip Richardson, Eugene Delmar whose games and doings are be chronicled . The year 1867 began as did it's predecessor with the championship of the New York Chess Club, the championship remained a handicap tournament but this year rather than a knockout tournament, each player had to contest two games against each opponent, exclusive of draws. Mackenzie would again win the championship, but who would finish in second place was in doubt til the very end. But in the end both Philip Richardson Eugene Delmar agreed to divide second and third place, each player not finishing all their games at the end of the tournament. The year 1867 also saw the change of editorship of some cities chess columns, and new chess columns beginning, the sheer number and variety of chess columns is to be envied by the modern reader. 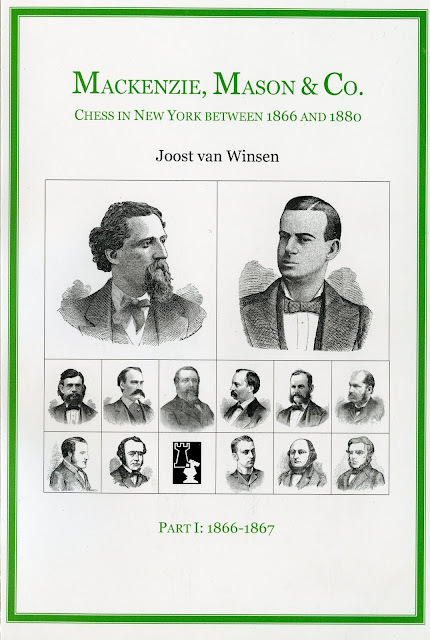 Van Winsen has given us glimpse into the window of what was nineteenth century chess in New York, and as future volumes appear and that glimpse becomes a extended view, the rich history of chess in nineteenth century New York will emerge. Mackenzie, Mason & Co is a limited edition of a hundred copies, so get your copy now, if you in least interested in chess history.